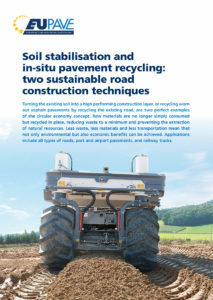 EUPAVE released a brochure entitled “Soil stabilisation and in-situ pavement recycling, two of the most sustainable road construction techniques”. The publication highlights how recycling worn out asphalt pavement leads to not only environmental but also economic benefits. Indeed, recycling the existing soil means less emission of pollutants, less nuisance and less degradation of the adjacent road network among other advantages. The brochure also shows benefits of soil stabilisation with binders as an environmental-friendly and cost effective method of converting poor quality soil into structural layers with high bearing capacity.